We are one of the renowned manufacturers and exporters of Coir Pith Blocks. 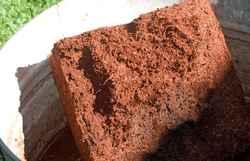 Coir pith is popularly known as coir dust or coco peat and is used to process these blocks. Our products are popular for having superior water holding capacity and are appreciated for being biodegradable & eco friendly. These are available in different sizes as per clients' specifications. Application areasHydroponics Agriculture Horticulture Floriculture Soil Erosion & control. Looking for Coco Products ?